During the past week we undertook our annual Kickathon across the classes at Winsford and Cuddington. The Kickathon consists of each participant speed kicking a target for a set time period (5 minute for over 12 and 1 minute for under 12s). There are 3 different sets of kicks consisting of front, side and turning kicks with each person doing a set of each kick for their assigned time period. So for adults 5 minutes of front kicks followed by 5 minutes of side kicks and then 5 minutes of turning kicks. We have pleasure in announcing the successful promotion of the following members to their next belt grade, after successfully completing their grading assessment on Friday 29th April 2016. Congratulations to everyone who passed, your student accounts will be upgraded in the coming days to your new levels. The instructors and officers would like to wish all our members, friends and family a very happy and prosperous new year and all the very best for 2016. Each year we select one student from each section as the most improved over the year and also one as student of the year. This year thw awards go to the following people. Congratulations gentlemen on a fantastic result. Congratulations to everyone on the fantastic effort and results. It is with great pleasure we would like welcome Mr Ross Sharman and MMU TKD to Blue Dragon as the newest members of our ever growing group. Mr Sharman, 4th Degree Black Belt and head of Sharman Martial Arts brings with him a wealth of Taekwon-do experience and knowledge. 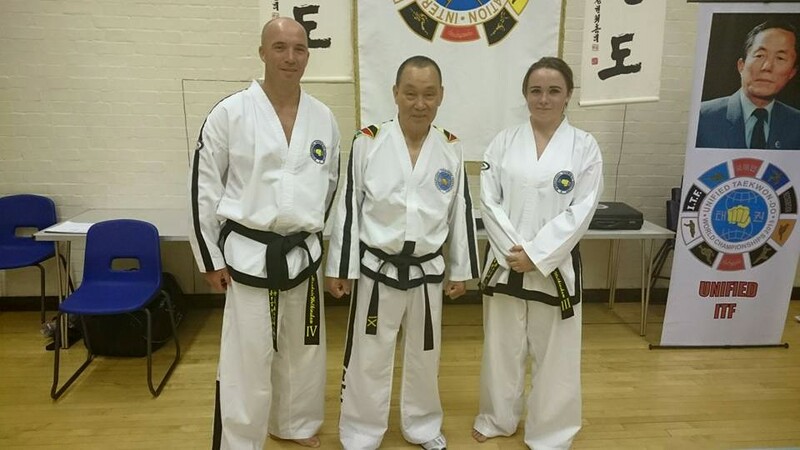 Congratulations to the following members who have successfully been promoted to their next belt grade following a grading exam held on Monday 12th October 2015. Congratulations everyone, all member accounts have now been upgraded to include your new grade. The 3 most senior members of BDTKD attended the recent Unified ITF World Championships, which were held in St. Albans, England in July 2015. Winsford club instructor Miss Lyndsay Walkinshaw along with Blue Dragon Taekwon-Do principle instructor Mr Alasdair Walkinshaw made the trip to train with Unified ITF president, Grand Master Hwang Kwang Sung, on Wednesday 8th July at a special one off international technical seminar attended by several Taekwon-Do Masters and senior Black Belts from countries including USA, Australia, South Africa, Agrentina and many more, not forgetting the UK too. Also making the trip south was Barnton club instructor Mr Garnet Ronander who spent 3 days Umpiring during the competition itself. Sadly Mr Ronander was not competing himself on this occasion due to still recovering from knee surgery earlier in the year but no doubt he will be back ready for the next World Championships in 2017.